Produced by Kyoto Animation and Animation DO, Free! 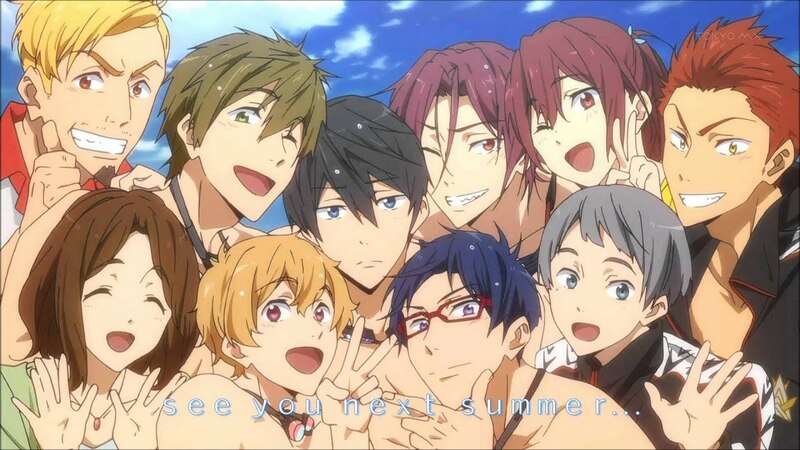 is a sport related anime series counting two season (Free! Iwatobi Swim Club, Free! Eternal Summer), a light novel (High Speed), an OVA and a Movie (High Speed! – Free! Starting Days). The first season original aired between July 2013 and September 2013, and the second season aired from July 2014 to September 2014. The movie was release in December 2015. What is Free! to me? Free! is a bunch of good-looking dude showing off the perfect body in the water. Another sport anime, but this series different from the other sport anime cause we are not only witnessing the struggle of the different character during their competition, but also in their everyday life, unlike other sport anime, like Kuroko no Basuke and Haikyuu! !, where the focus of the anime is on the sport itself. It is true the first season is centered on the swimming competition, but we can’t tell the same for the second season. The series have a whole bunch of interesting character with the very own personality. Some are borderline annoying, like Aiichirou Nitori, but still tolerable. My favorite is Matsuoka Rin, he is so easy to read. He try to look all though, but deep inside he care about he old team-mate. He is a precious little shark. Another character who I grow to like, special thanks to the OVA of Eternal Summer for that, is Yamazaki Sosuke. Although I wasn’t really sure cause of the way he was with Nanase, I came to like him more upon realizing that he actually put the future of Rin before his. That what we call deep friendship. I really enjoyed this series, not only cause of we get the chance to see the character half-naked for the most part of it, but also cause it show the meaning of friendship. Did you watched the series? Let me know what you think in the comment below. Free is literally my favorite anime of all time. Cause of the bromance. And the abs. And…..
Mel in Anime Land Free!